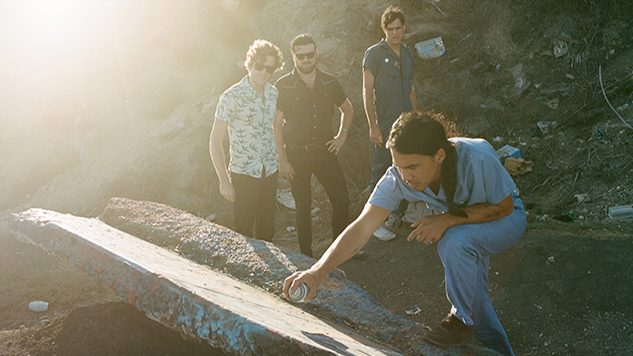 FIDLAR Share Apocalyptic Video for New Single "Too Real"
FIDLAR are back with the nihilistic national address “Too Real” and its apocalyptic accompanying music video. The single is off a forthcoming, as-of-yet unnamed album, which will be released through Mom + Pop Records. That’s the “real” part of “Too Real”: The barbs come fast and hard, and seemingly no one is safe. “There’s a bunch of white people calling white people white,” Carper sings in a spittle-fueled rage over dire newscasts and some creepy-as-hell old silent film. “You’ve gone so far to the left, you’ve ended up on the right,” he adds later, while the guitars go haywire and the drum set seemingly collapses in on itself. Guest appearances in the video include wildfires, zombies, Care Bears and John Rambo, a veritable four-horsemen-style collective. The single comes out in the midst of FIDLAR’s national tour, the dates of which can be found down below. Watch the video for “Too Real” and listen to FIDLAR’s 2012 Daytrotter Session below.